NOTE: Preludes Book 1, Ravel Sonatine & Jeux d'eau (ODE 723-2) available for dowload and streaming. Released in 1988. Hommage à Samuel Pickwick Esq. P.P.M.P.C. Pianist Marita Viitasalo's solo album on Ondine is a program focused on works by Claude Debussy (1862-1918). Préludes, Book II was composed during 1912-13 and represent the composer's late style. Suite bergamasque, published in 1905, is one of the most well-known pieces in classic piano literature. It inclundes Claire de lune, possibly Debussy's most famous piano piece. Marita Viitasalo studied first under Professor Timo Mikkilä in Helsinki. She continued her studies in Rome (Rodolfo Caporali) and in Vienna (Dieter Weber). Viitasalo is award-winning concert pianist and respected accompanist who has performed, among others, in Vienna, Salzburg, Berlin, Paris, London, Edinburgh and New York. Viitasalo has also held a piano professorship at the Sibelius Academy 1981-2010. 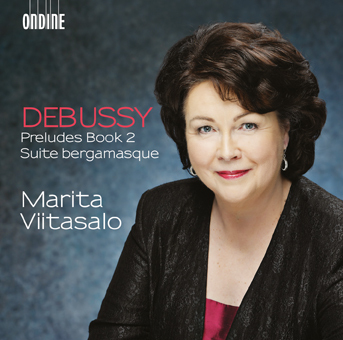 Since the 1980s Viitasalo has recorded several recordings as a Lied accompanist, but as a soloist she is particularly known for her performances on the works of Debussy, Ravel and Sibelius. Marita Viitasalo was awarded with the Pro Finlandia Medal in 2006.